As part of a new promo in which four indie titles are slated to appear on the Vita handheld over the next month, Spelunky finally receives a release date. Spelunky, for those of you who prefer games that don't make you question your worth as a human being, is a randomly-generated platformer which features exceedingly simple gameplay coupled with the omnipresent specter of gruesome death. Fall more than a few feet and you die. Jump to the wrong platform and suddenly you're perforated with arrows. Anger a shopkeeper and ... well, let's just say that you should try not to upset anyone ballsy enough to make a living by selling shotguns in the depths of a forgotten ice cave. Currently Spelunky is available on the Xbox 360 and PC, and we've been waiting for months for the title to appear on Sony's Vita handheld. Anyone who's played Spelunky will tell you that the game's reliance on simple controls and quick reflexes would fit perfectly on a handheld system. Now, finally, we have word on when to expect the title. Over the course of the next month, four indie games are slated to hit the Vita as part of Sony's "PS Vita Summer Select" promotion. You can get full info on that sale on the official PlayStation.Blog, but the important part is that we now know that Spelunky is slated for release on August 27. 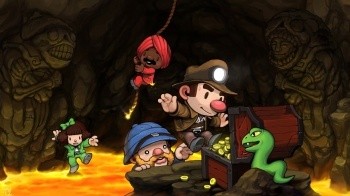 Thanks to the promotional offer, while Spelunky's standard price is set at $15, those of you with PlayStation Plus memberships will receive a discount on the title, reducing its cost to $12 until September 2. While we're still a bit sore over the notable lack of developer support for the Vita - it's such a waste that a technologically awesome system should have so few quality games - we're happy to see the handheld become something of a de facto home for indie titles, even if Spelunky will most likely cause more than a few Vitas to be thrown across the room in frustration.